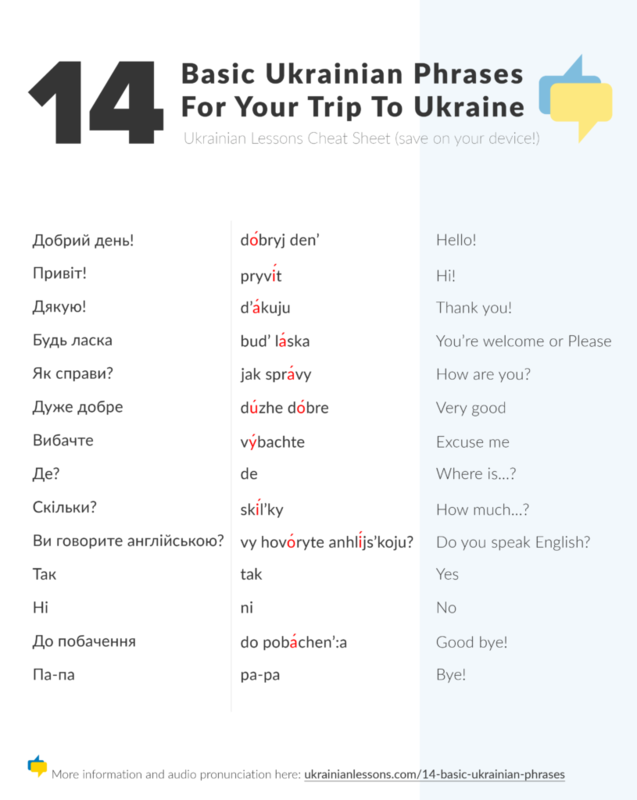 We’ll focus on the expressions and words you are most likely to use during a couple of days or weeks in Ukraine. You don’t even need to know Cyrillic alphabet to remember them. Just read the explanations, listen and repeat. (The word stress is marked with red). Save these Ukrainian phrases on your phone or print them and I guarantee you will have an amazing Ukrainian experience using them. Be confident and smile – people will highly appreciate your effort! Ukrainians use different phrases to say “hello”, depending on the time of the day. But “dobryj den” is universal and the most used. You can use it any time. This is a formal greeting, you would use “dobryj den” saying “hello” in the airport, in a shop, in the market, talking to people you don’t know. “Pryvit” is “hi” between friends and people you know well. You could also use “pryvit” to greet people you don’t know in an informal situation, for example, at a party. Learn more informal Ukrainain greetings with the Ukrainian Lessons Podcast Episode 1! Be grateful! Say “d’akuju” whenever you feel like you want to thank people. 1) Did someone just say “d’akuju” to you? Be polite and say “bud’ laska” (=you’re welcome) in response! 2) Also, “bud’ laska” has a different meaning – “please” – like in the phrase “Скажи, будь ласка” – “Tell me, please…”. Як справи? /Jak spravy/ = How are you? This one is a good conversation starter. Yes, I agree, you cannot keep the conversation alive in Ukrainian so far, but why not to start, asking “how are you?” in Ukrainian? “Jak spravy?” literally means, “How are your things?”, but we use it to ask about how the person is doing. It’s for both formal and informal situations. Де? /de/ = Where is…? Скільки? /skilky/ = How much…? A simple must-know question if you are going to buy or pay. Simply say “skilky” = “how much?” and people will name their price. Ви говорите англійською? /vy hovoryte anhlijs’koju/ = Do you speak English? До побачення /do pobachen’:a/ = Good bye! Oh no! Time to say good-bye? Choose one according to the situation. Use do “pobachen’:a” if you are in a formal situation (airplane, supermarket, business meeting). For informal farewell you can use a Western Ukrainian funny “pa-pa” or a Russian-like “paka”, common in Kyiv and Eastern Ukraine. Did you try out these phrases? 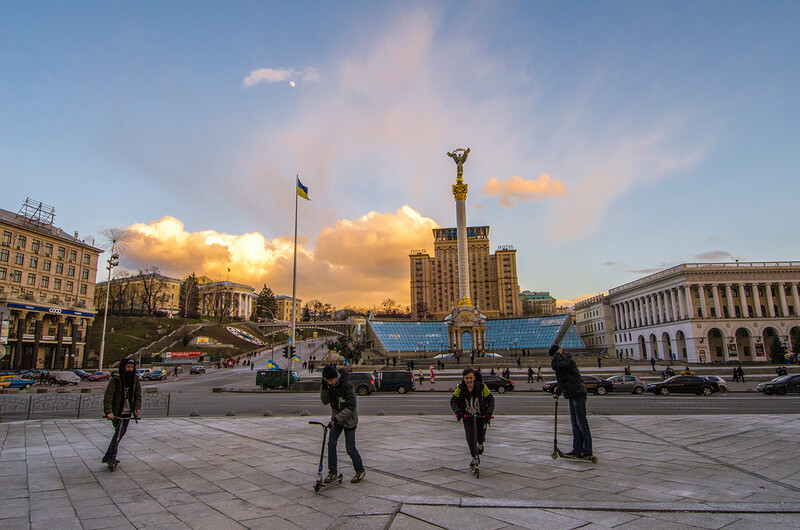 Bud’ laska, leave the comment about your experience in Ukraine below! Are you beginning to learn Ukrainian? Check our Ukrainian Lessons Podcast! It’s a free series of audio lessons that take you step by step through your Ukrainian language journey!